Hi Everyone and thanks so much for stopping over on the blog today to see what is new. I hope that you had a lot of fun on the hop this month and got lots of ideas with the new Ribbon Club Ribbons. 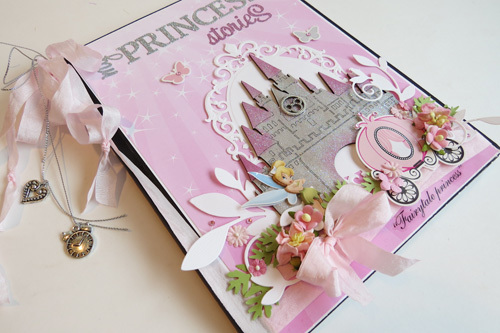 Today I have a special Princess Journal to share with all of you that I did for me. I work at Disneyland and get to meet lots of adorable princesses around the world and I needed a special place to put down all the stories that I have of them so I created this journal with lots of pretty ribbons, flower and papers with a fun Disney Princess theme. I just used a regular journal book for the base and created the front with a chipboard castle, Spellbinders dies for the oval and the leaves and fun sticker that I had in my stash. 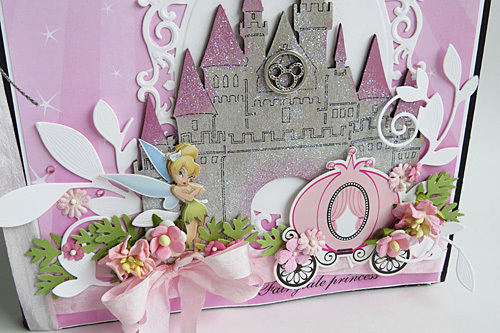 The pretty flowers are the WOC Sweetheart Blossoms in pink and WOC Gardenia's in shades of pink to match the paper. I love putting lots of ribbons hanging on the sides of my journals for bookmarks and I chose the lightest pink Seam binding ribbons for this one and some Metallic Silver String to tie on my charms. lovely , We are big fan's of disney world we have year round tickets and have take our grandchildren and have stayed on disney property. it is so fun to see the little ones all dressed up and have gotten their hair all done up , each one is just adorable we had our Gracie done up and what a living doll something she will never forget. We all had fun seeing her smile and be dressed in her outfit . this is all done at Down town Disney Not at any of the parks. We love going and enjoying all of it we have been there for Mickie's not so scary Halloween, and for the Christmas one as well again the kids just loved every bit of it and so did we. it truly is Magical being there. I absolutely adore this! It's perfect for you and your role at Disneyland! I hope you fill it with incredible stories and memories that you can look back on! I love that you put the coach and Tink in there too! Oh, and I just noticed the clock! Perfect! Teresa-I love this card! Beautiful job!